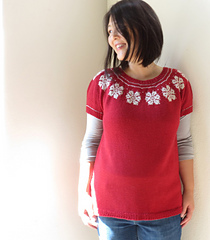 This is a seamless pullover worked from top down with colorwork motif around the yoke. Instructions of both short and long sleeves are included. 0 to 3” / 0 to 7.5 cm positive ease is recommended. Sample is shown with 3” / 7.5 cm positive ease. Sport Weight, sample used Cloudborn Superwash Merino Sport Twist (100% Superwash Merino Wool, 200 yards / 183 meters per 50 gram skein). Yarn A – Short Sleeve Version: 740 (830, 910, 1000, 1080, 1180, 1280, 1370) yards / 680 (760, 835, 915, 990, 1080, 1170, 1255) meters. Yarn A - Long Sleeve Version: 1020 (1110, 1240, 1320, 1410, 1550, 1650, 1760) yards / 935 (1015, 1135, 1210, 1290, 1420, 1510, 1610) meters. Yarn B – 80 (85, 90, 100, 105, 115, 120, 125) yards / 75 (80, 85, 95, 100, 105, 110, 115) meters. US #3 / 3.25 mm or change needle to obtain gauge in stockinette stitch. Also, 1 size larger needle for colorwork section. 24 sts x 34 rounds = 4” x 4” / 10 cm x 10 cm in stockinette stitch with the smaller needle. 30 sts x 28 rounds = 4” x 4” / 10 cm x 10 cm in colorwork with the larger needle. Note: if only one gauge can be achieved, it is most important to have the correct gauge in stockinette stitch. 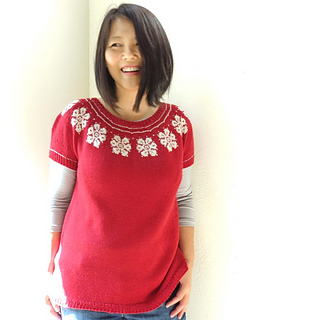 Sweater is knit seamlessly from top-down in the round. 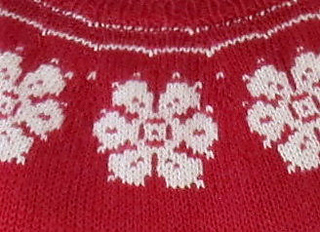 Colorwork motifs around the yoke. 2 sleeve lengths, and both short and long sleeve versions are included in the instructions.